Made perfect golden-brown toast, melted cheese evenly and baked cookies the fastest of the models tested. The extrawide glass door makes it easy to watch food while it cooks (www.krupsusa.com). This retro-cool oven aced every test, but it has no “toast” setting—you set the temperature and timer as with a regular oven. The door closes snugly, which prevents heat loss (www.target.com). 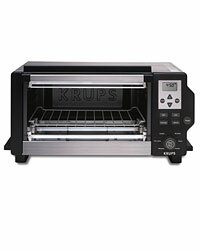 The machine is large—almost as big as a small wall oven—so it’s best for kitchens with lots of counter space. Fits at least six slices of bread, and the stainless steel baking sheet is supersturdy (www.hamiltonbeach.com). The convection feature is superquiet. This model has touch-pad controls for complex functions, making it better suited as second oven than as a toaster (www.cuisinart.com).